Whether you are a novice or experienced angler a trip to one of New Hampshire’s remote ponds or streams is sure to be an adventure. Ponds are accessed by 4 wheel drive vehicles and you’ll fish out of float tubes or float boats. Only high quality rods (2-5 wt.) are used with emphasis on “light action”! Most of these remote ponds hold brook trout and rainbows and hatches are prolific. 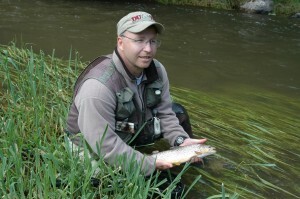 If “wild” trout are what you are looking for we have have plenty of smaller streams that will produce. Most entail a short or moderate hike, but it is well worth it. Fish are feisty and colorful. Lakes Region trips (streams, rivers and ponds)- 5 hour trip ($200 for one angler, $100 each additional angler) snack food/beverage included. Nothern trips all day($200 for each angler-maximum 3) Lunch included. 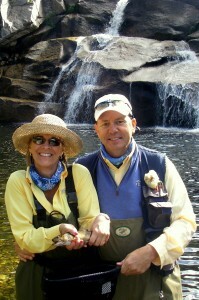 We run 4 day fly fishing schools in both the Lakes Region and the North Country of NH. Contact us for our next schedule of schools. INDIVIDUAL AND SMALL GROUP CASTING LESSONS: are available on request. Our “quick Learn” programs are integrated programs that can include not only dry land casting but casting on the water. Programs are tailored to the needs of the student and can combined with actual “on the water” fishing. All lessons are taught by Rick, who spent years as a competitive fly caster, competing across the country with some of the top casters in the world. FLY TYING LESSONS: Group lessons are offered during the winter. Individual lessons upon request. Contact us for more details and class schedule.